Abak Atama Soup is a delicious soup popular amongst the Ibibios of Akwa Ibom State in Southern Nigeria. 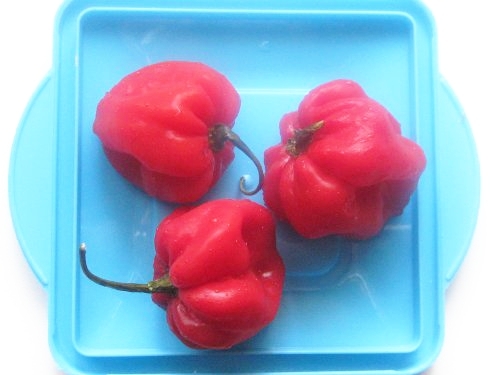 Its name is derived from the two dominant ingredients: Palm Fruit Concentrate (Abak) and Atama Leaves. The base palm fruit concentrate used in preparing Abak Atama makes it similar to the Banga soup of the Niger Delta origin and the Ofe Akwu of the Igbos but the difference is in the spices and vegetables used for each of these soups and stews. How to Cook Banga Soup/Stew [Video] This video is very similar to how to cook Abak Atama Soup. 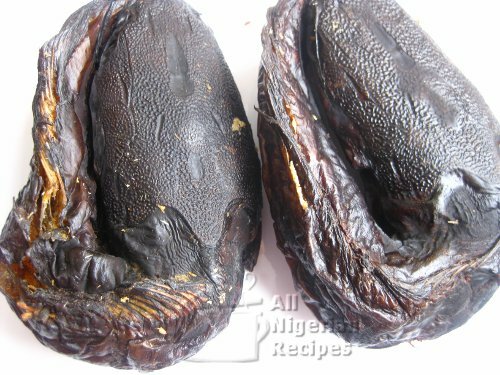 The palm fruit extract used in cooking Abak Atama Soup is quite different from the red palm oil used in cooking Nigerian food recipes. 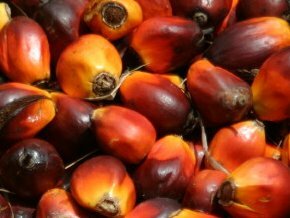 Palm Oil is pure oil extracted from the palm fruit pulp at high temperatures while the palm fruit extract used for the Abak Atama Soup is extracted at a very low temperatures and is a mixture of oil and water. Palm fruit oil extracted for Abak Atama Soup contains less saturated fat than palm oils. In Nigeria, we have the "agric" and native palm fruit. The "agric" palm fruit has more flesh and can yield more oil and extract while the native palm fruit comes in smaller sizes but gives your stews and soups a more delicious flavour. It is best to combine both where possible. Atama leaves (English name unknown) give the soup its unique aroma as well as taste. 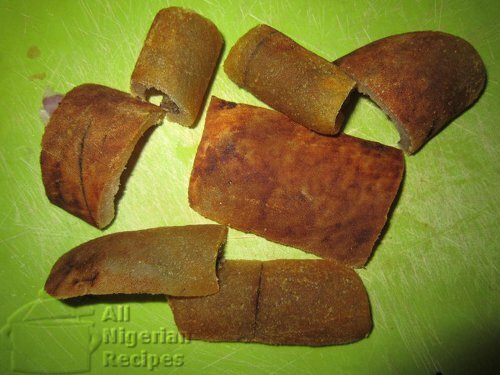 Just ask for atama in Nigerian markets where soups ingredients are sold. The leaves dry up easily so where the fresh ones are not available you can use the dry ones. Fresh atama leaves have a bitter taste. 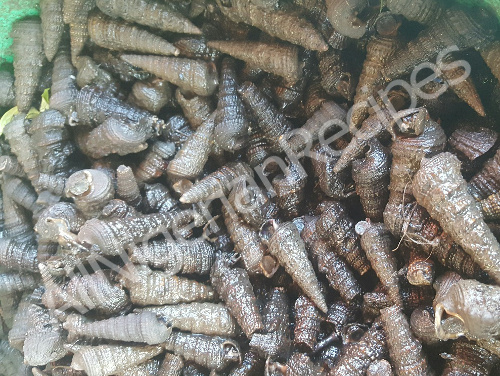 Please note that unshelled periwinkles are used for this recipe. Fresh fish (fresh cat fish) also goes very well with this soup so you can use it instead of dry cat fish. Dice the onion, blend the fresh Pepper and wash and cut the ponmo into small pieces and set aside. Soak, debone and clean the dry fish. Debone and clean the smoked fish. Rinse in cold water making sure they are free from sand. Then break them up into desired pieces and set aside. Cut of the pointed ends of the shells of the periwinkles with the blunt side of a matchete. This is known as trimming the periwinkles. This can be done for you in Nigerian markets. Wash them thoroughly to remove all sand. Wash several times till the water runs clear. 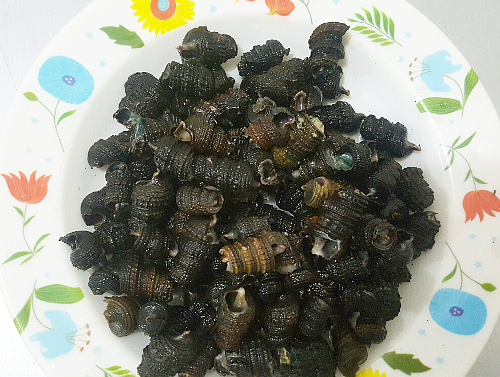 Place the periwinkles in a pot, cover with water and boil with a pinch of salt for about 10 minutes, drain off the water and set the periwinkles aside. While boiling the periwinkles, do not cover the pot else it boils over. 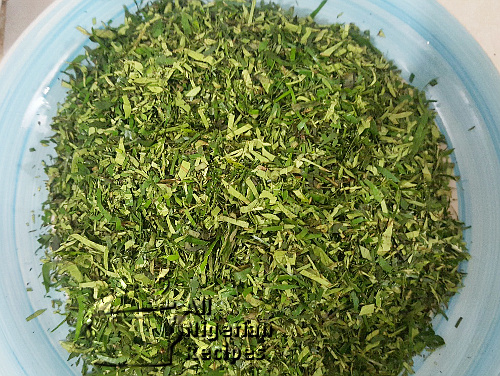 Wash the atama leaves thoroughly and cut into thin slices like the way we cut afang leaves. Atama can be sliced for you by sellers in Nigerian markets. 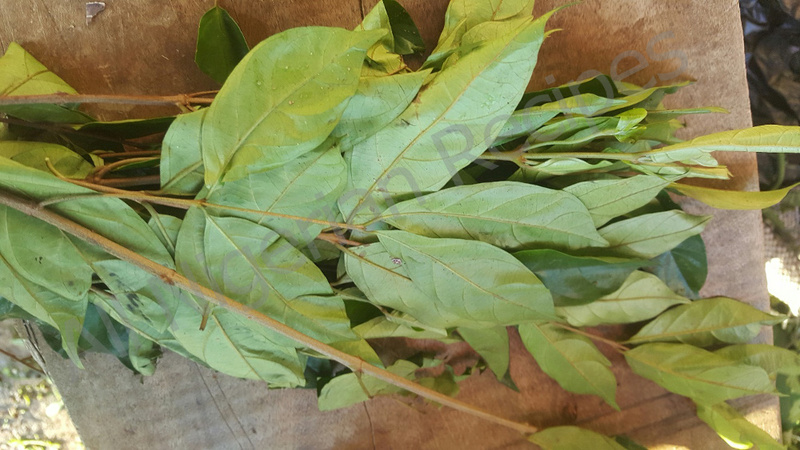 If you wish to reduce the bitterness, squeeze and rub the leaves between your palms and fingers while washing the sliced leaves just like washing bitter leaves. Change the water a couple of times. 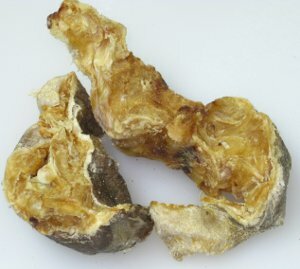 The dry leaves are not as bitter as the fresh atama leaves, some of the bitterness is lost during the drying process. Place the pieces of beef or goat meat, pieces of ponmo and stock fish in a pot. Add as little water as possible, add the onion (diced) and the stock cubes then cover and cook till tender. Add the deboned dry fish and/or smoked fish when almost done. Pour the extracted palm fruit concentrate in a another pot, set the pot on the stove and start cooking on high heat. Leave to boil till you notice some red oil at the top of the palm fruit extract. 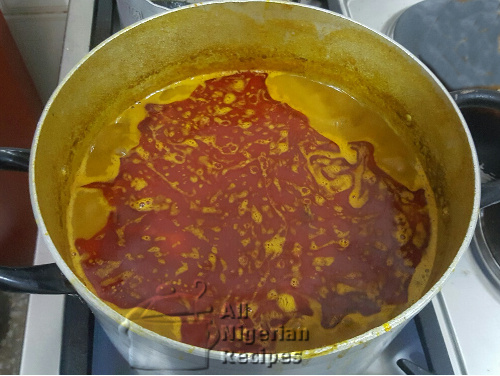 If you think that it is watery, cook till the extract has thickened to a medium consistency. 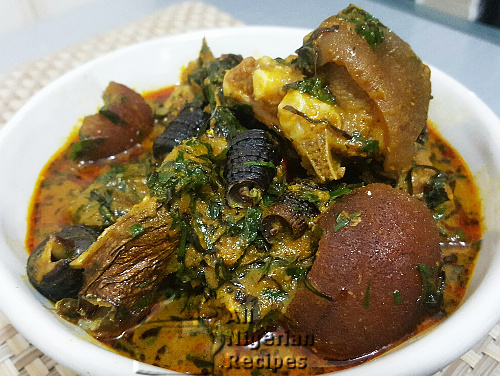 Add the cooked meat and fish with the meat stock, crayfish and pepper, the precooked periwinkles, the atama leaves and salt to taste, stir gently and leave to simmer for 5 minutes. When the beef and fish are well done, add the palm fruit concentrate, stir and add water if necessary to get the consistency you like for your soups. Leave to boil. Add the rest of the ingredients (continue from step 3 above). NB: Do not worry if the soup appears light. Abak Atama Soup has a tendency to thicken by the next day. It can also easily become more salty overnight so please add salt sparingly. Watch the video of Banga Stew below, the precedure is exactly the same for Abak Atama Soup, the only difference is the vegetable used.